A national commercial real estate owner hired Realogic to abstract leases for their portfolio of over 2,000 tenants. Realogic performed a number of critical tasks, including initial and ongoing lease abstraction, coordinating scanning of all lease documents and integration of key lease data points into the client’s lease flow process. As a result, our client was able to track and manage all critical lease dates more efficiently. They had quick and easy access to all lease information, including original leases and abstracts. And their critical lease data was integrated into their lease flow process, all of which enabled them to manage their properties more efficiently and effectively. Realogic continues to administer leases for the client for over 12 million square feet of property. Sizable outstanding receivables jeopardized the sale of a client’s 750,000 square foot office building. The asset manager requested our help identifying, quantifying and collecting the amounts owed. Realogic reviewed leases on-site and performed reconciliation work. We prepared invoices for back rent and presented them to tenants. $1 million in outstanding receivables were collected and reconciled within 45 days to expedite the closing. A large national client made the strategic decision to outsource their entire lease administration function. Lease data was to be entered directly into the client’s CTI® accounting system. Realogic spent two weeks on-site with the client discussing lease administration procedures and the use of CTI® for lease administration. The client gave Realogic remote access to the requisite CTI® modules and added us to the e-mail distribution list for new lease documentation posted to SMARTCabinet®. Upon receipt of new lease documents, Realogic administered leases directly into CTI®. We also became the primary point of contact for property managers with questions about leases from their buildings. Realogic continues to administer leases for this client. The buyer of a 650,000 square foot office building asked Realogic to abstract 110 leases, compare the results to existing valuation-DCF files and to present all reconciling items to the buyer to negotiate potential credits at closing. Realogic discovered and documented 55 reconciling items, then conducted a sensitivity analysis on them at our client’s request. Realogic’s work uncovered $4 million of free rent for an anchor tenant that was not included in the original model of the building. A property manager discovered that the letter of credit documentation for a newly assigned property was deficient. The property’s previous owner/manager had allowed a large letter of credit to expire, which was missed during the due diligence process. The tenant eventually defaulted, costing the building $3 million. To help prevent future defaults and losses, Realogic began to more carefully administer the building’s leases and added letter of credit tracking to the lease administration process. As a result, the expiration dates for all tenant letters of credit are now documented and closely monitored, and the property manager routinely receives an updated critical dates report. A top private equity fund needed due-diligence done on a cross section of a large FDIC pool. The fund was bidding to participate in an FDIC structured sale. The portfolio consisted of both performing and non-performing loans in all asset classes for properties located across the country. The client needed due-diligence done on approximately 150 of the loans, most originated by small to medium-sized banks. Armed with limited information, Realogic performed site inspections on 60 of the 150 properties. Next, we reviewed the contents of the loan files to determine the loans’ default status, DPO probability and amount, cross collateralization with other properties and other critical information. We then reviewed rent rolls and historic financial information, gathered intelligence to determine property occupancy and current asking rents and compiled market data, such as market rent and occupancy. Based upon our findings, we generated in-place and stabilized values for each property. Finally, we delivered an asset summary and site inspection package for each property, including cash flows, maps, photos and all market data. A major Wall Street investment bank experienced sudden growth and needed assistance responding to an increase in loan volume and hightened customer expectations on loan turnaround time. Realogic placed a multi-level team in the field that was supported by our corporate office. Our team leveraged their diverse and extensive experience in CRE appraisal, valuation, consulting, securization, due diligence and underwriting for the assignment. They quickly assimilated to the bank’s culture and supported every step in the loan process, from initial sizing through closing. Realogic’s ability to scale quickly, coupled with our broad and diverse experience, enabled the bank to meet the increased demands of its customers. An investment bank engaged Realogic to design a custom Excel® model to analyze over 1,000 debt and equity positions across all asset types. The model needed to accommodate unleveraged assets and illustrate each asset’s existing cap stack. The client also wanted to input the requisite assumptions for the ideal hold period and disposition of said assets. The Realogic team continually solicited feedback from our client and worked closely with them throughout all stages of the project to ensure that implementation was smooth and efficient. Realogic leveraged its deep understanding of financial analysis as well as its expert Excel® skills to create and present a solution that met the client’s immediate and on-going needs. A national sponsor of multiple private equity funds needed an outsource partner to assist with financial analysis, both during and after an intensive acquisition effort. A mid-sized REIT sought a partner to support its five-member internal team for work on single asset and portfolio acquisitions, as needed. Realogic provided a wide range of services to the client on an on-going basis. These included completing lease abstracts during due diligence; conducting cash flow analysis and valuation and return sensitivities under tight time-frames; using valuation-DCF software to compare cash flow analysis results; and, upon closing, supporting asset management. Realogic’s client needed their financial and non-financial lease information organized in a concise, easy to use format to help them make sound decisions and retain tenants. Realogic used leading CRE software to administer leases for the client on an on-going basis. Critical data, including key financials, options and encumbrances dates, termination rights and color stacking plans, is now shared continuously with the client’s property and asset managers, owners, leasing agents, property accountants and lenders. The owner of a portfolio of special-use assets requested a valuation-DCF run to help evaluate a joint venture proposal from an investment banking firm. The client needed the work completed within seven business days. First, Realogic confirmed the assumptions that were required. Next, we mapped and imported the appropriate data fields from Oracle® into a valuation-DCF software product. We conducted a detailed review of the imported data to assure that it was accurate. Finally, we conducted a sensitivity analysis using one of our proprietary software products. In just four days, Realogic delivered a complete, accurate 2,000 tenant files to the client. A client was going public and needed to straight line their rental income for the previous 5 years. Their portfolio consisted of nearly 20 million square feet of property and over 2,500 tenant records. Each asset required a three to five year analysis, depending on the acquisition date. 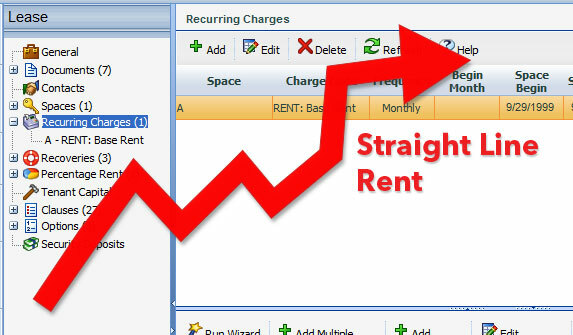 Realogic created a customized Excel® model to calculate the straight line rental revenue and adjustment amount at the tenant level, with building level aggregation. Realogic then used historical rental rolls to prepare tenant rosters for each building to determine its occupancy over the previous five years. After the initial setup, Realogic worked with the client’s accounting firm to audit the results and resolve any discrepancies to comply with standard accounting guidelines.